Diabetes is running rampant in the United States. According to the CDC, “11.3% of American adults age 20 and older have diabetes,” while “35% of American adults age 20 and older have prediabetes.” That means almost half of the adult American population have diabetes or prediabetes! Of course, once people have diabetes, they are more susceptible to other health issues such as heart disease and stroke as well as blindness. Why is diabetes so rampant? Some point to our increasingly sedenatry lifestyle, others point out our dependence on fast food, and others mention our obesity. But what isn’t mentioned as much is our dependence on sugar. 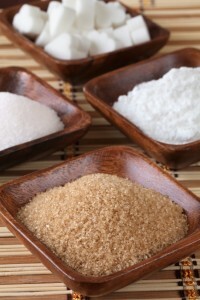 Not just the sugary desserts and snacks we eat, but the sugar that is in so many of our processed foods. Could You Give Up Sugar for a Year? Recently, the Schaubs (a family of four including father, mother and two daughters ages 11 and 6) have been getting quite a bit of media exposure because they just finished living a year without sugar. You may think their year entailed saying no to soft drinks and Oreos, but it goes much further than that. They “cut out anything with an added sweetener, be it table sugar, honey, molasses, maple syrup, agave or fruit juice.” They also “excluded anything made with fake sugar or sugar alcohols. Unless the sweetness was attached to its original source (e.g., a piece of fruit),” they “didn’t eat it” (Yahoo! Shine). Giving up desserts and sugary snacks is hard enough in our culture that is filled with them. But when you try to give up all the added sugar, suddenly your food choices seem to become very limited. The Schaub family recounts what they couldn’t eat, stating, “Once we started looking we found sugar in the most amazing places: tortillas, sausages, chicken broth, salad dressing, cold cuts, crackers, mayonnaise, bacon, bread, and even baby food. Why add all of this sugar? To make these items more palatable, add shelf life, and make packaged food production even cheaper” (Yahoo! Shine). Of course, with so many prepared items and convenience foods full of sugar, the Schaubs had to spend a lot more time in the kitchen preparing and cooking their own food. Besides giving up sugar, which many of us might have a difficult time doing because it is so incredibly addicting, many more of us likely say we don’t have time to cook everything from scratch. Eve Schaub, who has just written a book about her family’s experience, Year of No Sugar: A Memoir, notes that her family just felt much healthier in general after not consuming sugar for a year. The simple fact is that sugar is embedded in so many items, even if we don’t think we have a sweet tooth, we’re likely eating many grams of sugar a day, so we don’t know what it feels like to be truly sugar free. Allison Aubrey of NPR states that someone eating a 6 oz. cup of organic yogurt (seemingly making a healthy breakfast choice), will consume their daily quota of sugar (as set forth by the American Heart Association) in just that one yogurt. Sugar is hidden in so many items and our sweet tooth now so large that the “average American consumes 77 pounds of sugar a year” up from 4 pounds a year in 1700 and 18 pounds a year in 1800 (National Geographic). We’re drowning (or perhaps happily swimming) in the sweet stuff, and it’s killing us. Richard Johnson, a nephrologist at the University of Colorado, Denver, states, “It seems like every time I study an illness and trace a path to the first cause, I find my way back to sugar” (National Geographic). Retraining your taste buds, as the Schaubs did, is difficult. Yet the reward, the Schaubs found, is that they lost their taste for super sweet foods. They felt healthier. They likely were healthier. It’s unfortunate that companies put so much sugar in our food, but now that we know sugar is hidden in unlikely places such as salad dressing and pasta sauce, we can avoid it, if we want to. And maybe we’ll also be avoiding a host of diseases that Johnson links to sugar. I never thought I could. Then we went travelling for six months and stopped eating a lot of processed food and desserts, etc (barring a few select countries.) We finished off with a road trip in the US. And honestly, after our first week there I was DONE with sugar. Gorged on chocolate, candy and cereal, and it was just wayyy too much. Overloaded myself and now my sweet tooth is a fraction of what it used to be. Sugar is one of those things that you think you can’t stop eating, but once you do, you don’t miss it as much. At least that has been my experience. Sugar makes me feel absolutely disgusting. Whenever I eat a bunch of candy, I literally hate myself for hours. I wish I could always resist the temptation. For me giving up sugar would only account for removing from my cups of tea, but it’s true that it is in practically everything. I’m not sure I could be so brave as to eat only organic foods etc. And for me it’s sodium which is the more dangerous ingredient of a lot of processed foods. I don’t think I can give up sugar, I really love sweets. But, I tried to control it, diabetes runs in our blood. My father was diagnosed that he had a diabetes when he was in his early 30’s. I make a point of avoiding refined sugar. I do eat some honey and maple syrup. I’m just one of the fortunate few born without a sweet tooth, so avoiding sugar is not much of a challenge for me. Watch out though if I get within reaching distance of pizza or nachos! Lucky you! I had a sweet tooth that just kept growing. Giving it up altogether was the best move for me. By eating simpler food we have more control on the sugar we consume and we get used to less sweeter tastes. I don’t really have a sweet tooth so I am good most of the time already. Eliminating 100% though, I don’t think I could do it. I respect what the Schaubs did, but I am perfectly happy just keeping sugar at a minimum and having sugary days every once in a while. I try to get all of my sugar intake from fruits and some veggies. Like Kurt said, refined sugar makes me feel awful. I’m not always successful in my attempts at not eating it, but I try and I notice a difference when I avoid it. The diabetes and other health issue numbers in this country really scare me. Not only are those diseases killing people, they’re costing people tons of money in medical expenses. I’ve done no sugar diets for anywhere between 2 weeks and three months at a time, and Eva is right: it really does make you feel so much better. I just got off of a month of no sugar, and when I tasted it again, I had no pleasure in it whatsoever. It was yuck! I’ve actually been thinking about this very thing the past week, mainly because there is piles of Easter candy around our house, at my work, etc. I definitely think I consume too much sugar and should cut back. I did “The Daniel Fast” for a week during Lent and you can’t eat any processed foods, meat, levened bread, etc. and my body really struggled initially. I was constantly tired, and I can’t help but think sugar has artificially given me a boost for so long that my body had trouble without it. It’s scary to think how ‘dependent’ our body can become on excessive sugar intake. I’ve tried; my bpdy craves sugar like a drug.Probably need to us the same approach as the one I used when giving up smoking. My grandfather died because of diabetes, and that made our family more cautious when it comes to sweets and chocolates. I haven’t eaten sugar in 2 years on the keto diet. I lost almost 50 pounds and feel great. It’s insane to realize how much sugar is in everything once you start to look for it.